[patron] "So how are you being affected by the economic situation?" [truck-dude-with-curly-hair] "People still have to eat. You see, in the great depression, there was a flourish of food trucks as people looked for low cost alternatives." The irony of a bunch of us yuppies standing around on mission street eating $5 organic-mushroom-filled tacos not being lost here. [truck-dude-with-curly-hair] "Well that's not necessarily true. But it could be true!" I guess you had to be there. Great stuff guys - thanks for being here and thanks for picking an excellent location! 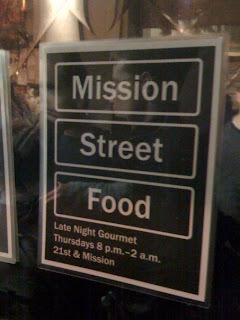 i was just wondering... i drove by the corner of 21st and Mission around 1:15 AM and didn't see any cart in sight. i thought you guys were gonna go til 2 AM? i'm sure something happened but what really did? i was fiending for pork belly!